The week started out great for the Northampton Yellow Jackets. In a makeup game against a farmer team from the central part of the state (Windsor High School), the Jackets continued with a bread and butter running attack that has served them well against young, small and inexperienced teams. On Tuesday, the relentless ground and pound attack rolled up a 32-6 win over a depleted Windsor squad. What a difference a day or two makes. Traveling to West Point to take on the Pointers on Friday was a wakeup call for Northampton, and exposed the offense as somewhat one dimensional. The Pointers crushed the Jackets 51 to 8. To be fair, despite the score, the game was a clean, hard-hitting affair, with few penalties and no serious injuries. The difference was really in the cleanness of West Point’s execution versus Northampton’s continual missteps–fumbles, missed tackles, blown coverages. West Point also dominated the line of scrimmage. The defense continually blew up Northampton’s line, and offensively, the line ran over the Jackets, and easily made it to the second level where they laid out the linebackers. This line dominance afforded several long runs for touchdowns. Finally coming up against a ranked defense exposed Northampton’s offense as dull and uninspired, and easy to figure out and defend. When you’re down 51-0 and your most creative play is an off-tackle run for three yards, it’s time for an intervention. Northampton’s passing game is non-existent. When senior quarterback Tripp Westcoat went out with a hamstring issue, he was replaced by freshman Liam Flynn. Flynn is a super talented, highly skilled player with high football intelligence, and a big ceiling (All-State potential). He may be the QB of the future, but the reality is he is not the QB of the present. There is a big difference between a senior and freshman–throwing Liam Flynn into the fire this early does not seem fair. And let’s face it, the seniors want to win it all right now, they have no future. With Westcoat back in the lineup, it’s time to consider a QB change to try and open up the offense with something called a forward pass. Either that or give Liam an offensive scheme that will let him succeed (easy slants, rollouts to receivers flooding the flat). Northampton’s next contest is the Homecoming game next Friday against Middlesex at 7:00. The Northampton Yellow Jackets found themselves down 14-0 early in the 1st quarter against the Northumberland Indians after giving up a pair of easy touchdowns. The first came on a 3rd and 16 play, in which the Jackets had the Indians pinned down, but allowed a long pass for a touchdown. On the next possession, Northampton went 3 and out, and a partially blocked punt and strong runback put the ball at the Jackets one-yard line. The Indians scored on the next play to make the score 14-0. Momentum began to shift as the Jackets forced three turnovers. Unable to capitalize, they went into the locker room down by 14. Both teams came out to begin the second half when the referees halted play due to visually sighting lightning. The game was pushed back to 9, then 10 pm, even as the officials were shown the weather, which indicated the lightning was coming from a storm north of Chincoteague and moving offshore. With lightning still flashing in the distance, it was decided to postpone the game until it could be completed at a further date. That date has not been established at the time of this publishing. The Northampton High School Soccer team is finally getting its groove. After tying its first two matches, the Blue Jackets have gone undefeated and unscored on in the last four games. They currently sit at 4-0-2. Thursday, Northampton shut down a fast and talented Arcadia club 2 nill. Early on, the game was marked by sloppy midfield play and tight defense. Northampton was able to attack the Arcadia defense on several occasions, but excellent goaltending kept the game tied 0-0 at halftime. Northampton was able to keep the pressure on the Firebird defense. Arcadia took advantage of defensive meltdowns by Northampton and got some strong strikes on goal, but goalie Chuckie Maldonado was able to come up with big saves. It should be noted that Maldonado has not given up a play related goal all season. The only two scores came from penalty kicks. Midway through the second half, the Jacket’s attack was starting to take its toll, as Arcadia was forced into a strictly defensive posture. With under 10 minutes left, Cameron Glennon took advantage of a defensive breakdown in the right penalty area and blasted a perfect, low strike into the goal giving Northampton 1 – 0 lead. Northampton continued to pressure offensively, with fast, physical play. Using his body, Joey Creed was able to muscle past the left side defender, but before he could fire on goal, he was fouled and was awarded a penalty kick. Creed set a strike into the left corner to give Northampton a 2-0 lead. Northampton, now with a record of 4-0-2, looks forward to Monday’s game against rival Nandua, at Nandua. VIRGINIA BEACH, VIRGINIA (February 2, 2018) – Through the Major League Development Association (MLDA), Virginia Beach City FC announces a multi-year agreement with D.C. United of Major League Soccer exclusively in Hampton Roads, Va. 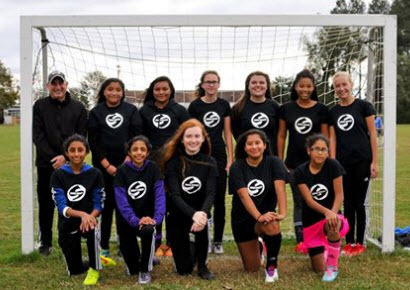 The two clubs will coordinate annual friendly matches at all levels, D.C. United will lead educational coaching sessions for VB City FC academy staff and will expand the scouting network between both clubs in Hampton Roads and the Washington D.C. Metro. In addition, Virginia Beach City FC will host D.C. United Talent Centers, where the top players in the region, regardless of club affiliation, will be coached and identified by D.C. United coaching staff. Virginia Beach City FC has had two players selected in the MLS SuperDraft which reflects on the quality of the club’s program. The Virginia Beach City FC NPSL schedule will be released on Tuesday, February 6, featuring a friendly match at the Virginia Beach SportsPlex. Virginia Beach City FC will also plan a Hampton Roads soccer club & fan night at Audi Field, D.C. United’s new stadium, this summer, 2018. 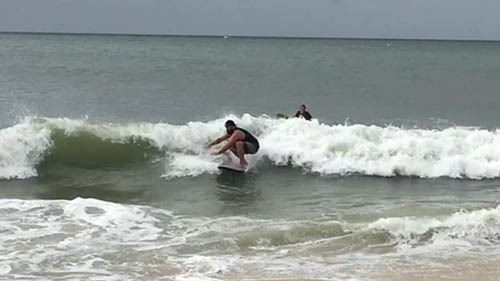 Hurricane Maria has devastated Puerto Rico and hammered the East Coast with storm surge, and its effects as it spun past the Eastern Shore even kicked up some swell on the Bayside. 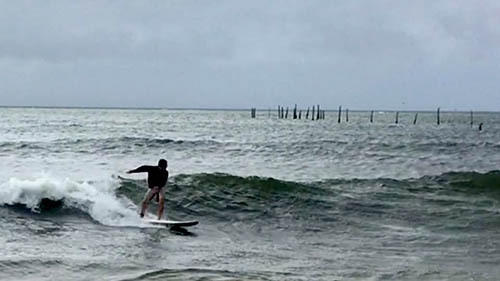 Intrepid adventurer Spencer Lee Travis was ready to get wet and take advantage of the tasty swell provided by Maria. Below are some of Travis’ images, taken with his IPhone propped up in the sand. Cowabunga! The waters of the Mid-Atlantic are home to some of the nation’s most sought after saltwater recreational species, including bluefish and summer flounder. In partnership with the Mid-Atlantic Fishery Management Council and the Atlantic States Marine Fisheries Commission and its member states, NOAA Fisheries is working to ensure sustainable and enduring saltwater fishing opportunities along the East Coast. Northampton High School graduate Tyler Webb was called up Thursday to the big leagues by the New York Yankees. He’s been pitching this season for the Yankees’ Triple A affiliate in Scranton/Wilkes-Barre, Pa. Webb is 3-1 with a 3.24 ERA in 21 relief appearances. He has 47 strikeouts in 33.1 innings pitching. In his first outing against the Texas Rangers, Webb made his way to the mound in the seventh inning. Webb pitched two innings, with no hits while recording his first major league strike out. Webb was rated No. 228 best high school player in the country by PG Crosschecker as well as the No. 6 best high school player in the state of Virginia. Tyler was part of the 2009 Virginia High School Coaches Association (VHSCA) A All-State team. Webb also played in the 2009 VHSCA East-West All-Star game. In addition, he pitched for the North Canes AAU squad. Webb is South Carolina’s career leader in appearances with 110 from 2010-13 (12 starts, 98 relief).The New York Yankees selected him in the 10th round of the 2013 MLB draft. 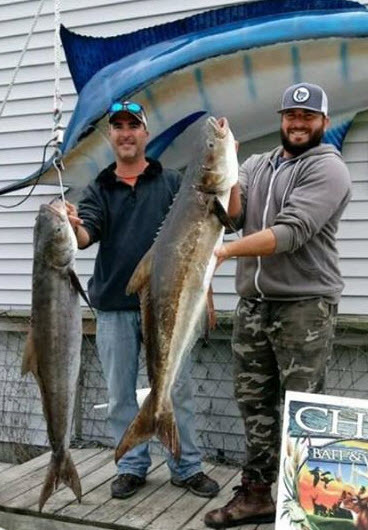 Cobia Season Regulations: Only one cobia per day of at least 40 inches in length is allowed. For anglers on a boat, there is a three fish maximum bag limit for the boat. The three fish boat limit may include only one cobia greater than 50 inches in length. Using a gaff to land cobia is not allowed. Note: Cobia permits are required in addition to a fishing license. The permit is free and may be obtained online at mrc.virginia.gov. Permit holders must report their cobia fishing trips. With Cobia season in full swing, the drum are also starting to hit. Get a red and black drum, along with a Cobia on the same day, and you have achieved the Chesapeake Bay Grand Slam. Red drum action has been busy, with some boats fishing near the breakers off Fisherman’s Island and along Nautilus Shoal and Nine Foot Shoal have been releasing dozens of good sized red drum. Some black drum are showing up near buoys 13 and 16, and sheepshead are on the structure along with spadefish. Trophy-sized flounder have been caught at the bridge this week. Cobia, red drum and some black drum can be found in the area, along with reports of good sized flounder. 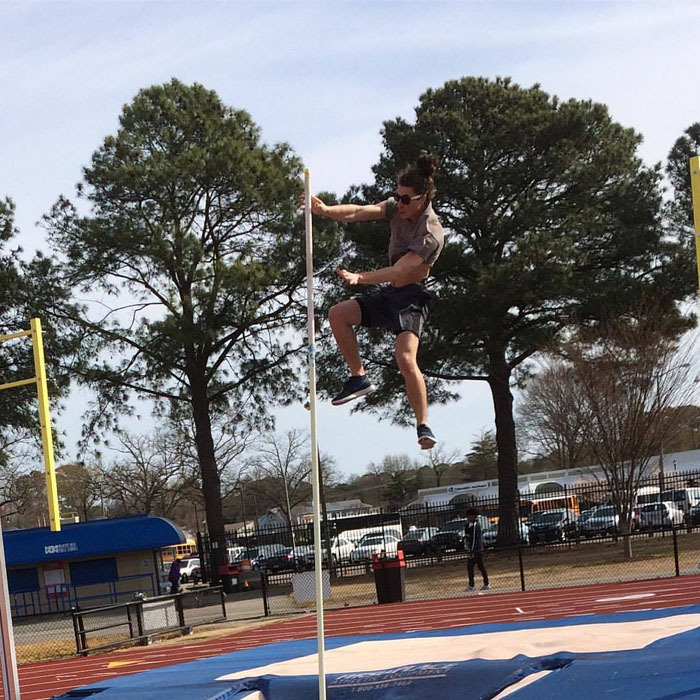 Northampton Sophomore Forest Flynn has broken his personal best in pole vault and now holds the Virginia State record in Division IA at 12 feet. Flynn broke the record at a meet held at Stephen Decatur. Flynn also competes in the 400 meter and 2 mile distances. One of Forest’s goals is to beat his father’s best of 13’3″. For parents that worry about their children sustaining sports concussions, football is usually the first associated with this problem. A new study, Sport- and Gender-specific Trends in the Epidemiology of Concussions Suffered by High School Athletes surprisingly indicates that not football, but girls soccer has the highest per capita rate of concussions and traumatic brain injuries in high school sports. The study, led by Dr. Wellington Hsu, professor of orthopaedics at Northwestern University’s Feinberg School of Medicine, was presented at the American Academy of Orthopaedic Surgeons (AAOS) annual conference, and found that roughly 27 percent of all injuries suffered by girls soccer players are traumatic brain injuries (TBI). From the study: To our knowledge, this is the first study to report that concussions now account for a higher proportion of injuries in girls soccer than boys football. The concussion rate for girls soccer is also increasing rapidly, and is now nearly tied with boys football and 3-fold higher than boys soccer. Technically, the study found that football injuries feature a 24 percent correlation between brain injuries and overall injuries. That percentage is almost identical to the one for girls basketball and the one for boys soccer, with each of those sports approximately one percentage point behind the prior sport on the list. The study also noted that concussions are apparently on the rise across all sports, with many rates essentially doubling following the introduction of TBI laws. Part of the reason for the rise in concussions in girl athletes may be an increasingly aggressive style of play. For those of us involved in youth coaching, we have seen more aggressive styles of play lead to collisions and head to head contact. For youth soccer coaches, teaching a more strategic, thought out, even a more measured, less contact-aggressive style could help limit some of these injuries. Working on strengthening neck muscles, as well focusing on proper techniques for heading the ball should also minimize head injuries. As a coach, the results of this study will alter my approach, as well as some of the drills and exercises we will be using next fall.